Light and strong aluminum clamp and titanium seat post bolts and nuts for your bike. Oil slick seat post clamp, bolt and nut for bright or silver seat post bolt for straight look. 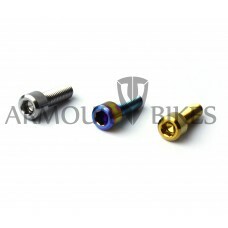 Our titanium seat post bolts and nuts are high quality product for reasonable price. 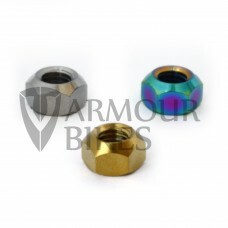 Armour Bikes seat post bolts & nuts can be used in integrated or regular seatpost clamp. 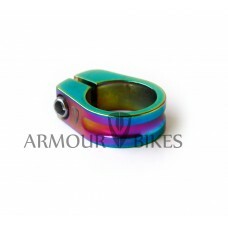 ARMOUR BIKES SEAT POST CLAMP 28.6mm OIL SLICKThis seat post clamp made of 6061-T6 aluminum; with las..
Armour Bikes seat post nutsLight and strong titanium seat post nuts for your bike.Oil slick se..
Armour Bikes seat post boltsLight and strong titanium seat post bolts for your bike.Oil slick seat p..